I’ve been remiss about posting here (life has been very full! ), but thought I’d get going again with an update on a post from last year. 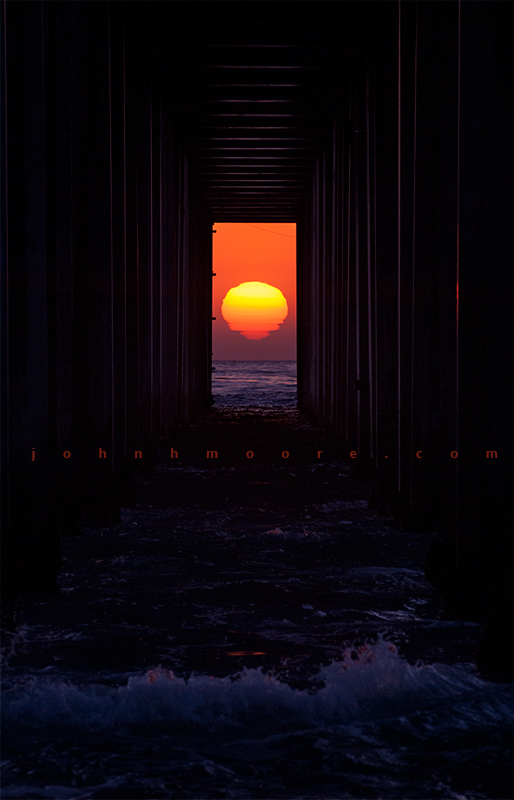 Last summer, I posted about an Epic Fail when I randomly ended up down at Scripps Pier in La Jolla to shoot sunset, saw a whole lot of photographers piled on top of each other under Scripps Pier, and stayed away from the crowd… only to realize later that it was That Night… the night when the sunset lined up with the pier. THAT’s what all those nut-cases had been doing under the pier! The sunset alignment happens twice a year—although many of those opportunities never materialize because of the marine layer we so often get here. This time around, we’d been socked in here at the coast for over a week with marine layer, but the forecast was for coming offshore winds and clearing skies, so we were cautiously optimistic. The alignment happens over the course of several days and, unless you have very precise data from past observation (now we do! ), it’s never entirely certain which day you want… so it’s best to show up a day or two before when you think the right day is and then just keep showing up every day until it’s all done. 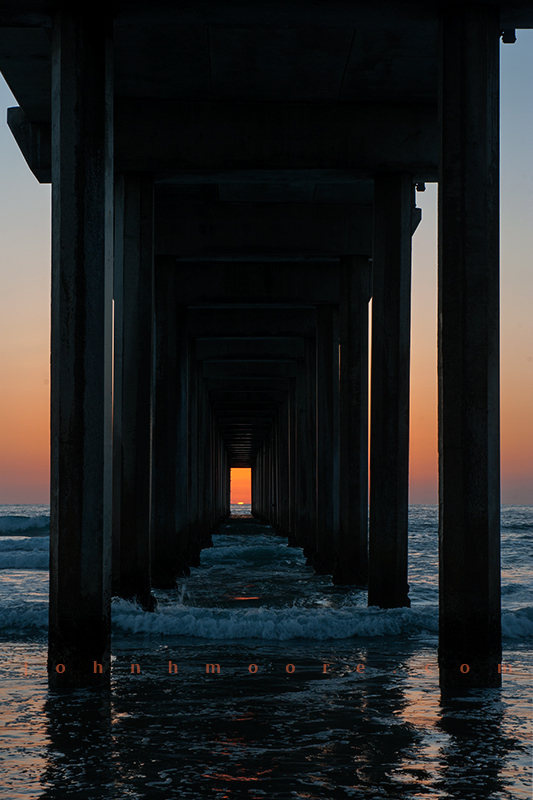 The sun will be a bit higher or lower each day in the “window” at the end of the pier when it centers. I showed up later than I’d wanted to, and two photographers were already there—waiting on the sunset. Dang, our dreams that others wouldn’t have figured out these dates were dashed! Worse, they weren’t the least bit considerate. They were there first and as far as they were concerned, it didn’t matter whether anyone else managed to get the shot or not—in the very limited space where one can set up for this shot. You meet a lot of great people out in the photographic community, but sometimes… not so much. I did the best that I could and set up for the shot… waiting, waiting, for the sun to come into view in the window. It did! And it moves so much more fast than you might think once that moment gets there! This night, though, the sun was only barely, barely visible above the horizon when it centered. After the fiasco of Day 1, I showed up very early on Day 2. First there. Not long thereafter, a very nice photographer from LA showed up, Tom Piekunka … he’d planned his work schedule to visit a customer down here in San Diego just so that he’d be in town for the sunset alignment. Had a nice time talking with him and we got our tripods set up to wait… before too long my photography buddies Phil Colla and Garry McCarthy arrived, and we all had a fine time hanging out under the pier, talking photography, and waiting on the critical 30 seconds once the sun came into view. Being first there, I was able to set a much more accommodating tone to the group that night, and quite a few photographers were able to set up under the pier for the shot. 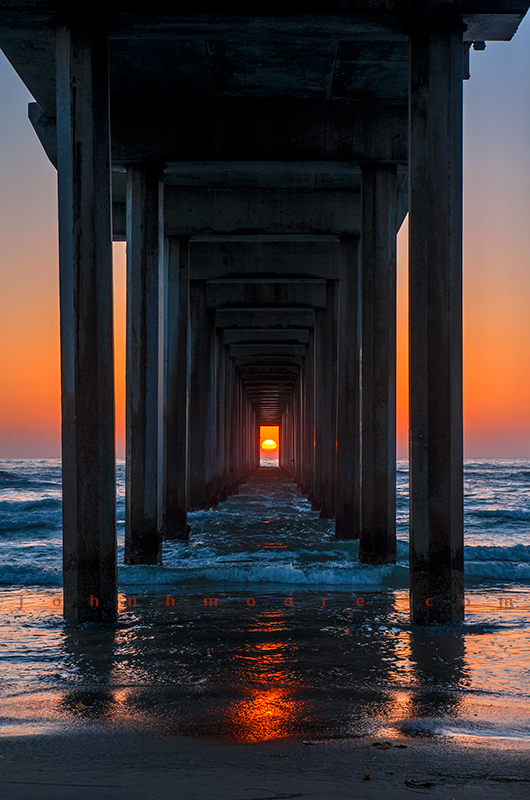 The time came and the sun was perfectly positioned under the pier when it centered… and I nearly missed it! I made the mistake of trying to do too many things. I was trying to (a) shoot wider (mid-focal range) at a crisp f/11 on my tripod-mounted camera, (b) shoot stopped down to f/22 at that same camera (quickly changing settings!) in the hopes of a sunburst, and (c) shoot long on a second camera to attempt a hand-held tight shot of just the window at the end. When an event is measured in seconds, perhaps it’s best to not try to do three things at once!!! But while I tried hard to miss the shot, I didn’t! And the sunset had this completely lovely orange glow to it. The sky had been very clear, which generally isn’t very good for sunsets, but there was some haze on the horizon, and, I suspect, some soot in the air from the large wildfire up in Ventura County. That may account for the spectacular orange color in the sky that night. The following day we were pretty non-committal about whether to head back down to the pier. In some ways, we felt like we’d gotten the shot the night before… and we figured that the sun would be too high in the window… and by late afternoon the sky was almost completely covered by clouds. So I forgot the cardinal rule of photography: you have to show up. If the sky clears and angels sing at the last minute, you can only get the shot if you’re actually there! Cut to a couple hours later, around sunset… where I watched the most amazing sunset ever… from my house… kicking myself over and over for not being down at the coast. I hear that just a couple photographers showed up… and the sky was amazing. As it turned out, the sun was indeed too high in the window when centered, but that did allow for a bit more light and sunbursts. While it wasn’t the shot that I was looking for, I’m sure that it was a great shot. So this year is both a great success… and an Epic Fail… at the same time. And the learning continues. YOU HAVE TO SHOW UP. This entry was posted on May 11, 2013. It was filed under Uncategorized. Hi could you tell me what the dates are for this shot. My son loves this kind of stuff and would be so excited to know. Is it with the solstice? We live in SD and have a daughter hat has relocated to NYC. I’d love to get a print of this image for her as a Xmas gift. Thinking of something 5×7 or 8×10 that I could frame with a large matt. Her room is 9×10 – can’t overwhelm but this would bring her such hometown joy! Please advise. Were you there this year? May 1st, 2017? I was there, along with about 15 photogs and 15 wandering beach goers. Not such a pretty sunset, kinda colorless. But fun to people watch. One guy with a ton of gear got up above us all along the pier embankment – wonder if he got a good shot over all our heads? The tide was coming in, so the front row photogs got pushed back a bit from their earlier set up. At the last minute, the sun was aligning, and some gent from the back with his cell phone…he wanders toward the front of the group… because he couldn’t see///well duh. Funny, as everyone yelled at him to get out of the way! Some people. Got a good pic from 2017?